The amount of heat needed to produce the Leidenfrost effect depends on the temperature at which a liquid boils (the boiling point). A liquid that has a low boiling point requires less heat for the insulating steam layer to form than a liquid with a higher boiling point. Which of these solutions demonstrate the Leidenfrost effect at the lowest surface temperature? Which solution demonstrates the Leidenfrost effect at the highest surface temperature? We’ve made this activity safer by adding non-flammable talc baby powder to the procedure. Talc baby powder reduces splatter and lowers the temperature required to produce the Leidenfrost effect (thanks to another cool science phenomenon called nucleation). Heat source: A hot plate or electric stove work best. Avoid using open flame. Avoid Teflon-coated (non-stick), greased, or ceramic pans for this experiment. Mix well, and store remaining ethanol away from the work area. Mix well; some salt will not dissolve. Do not use cornstarch baby powder, which can easily burn. Safety considerations: BE CAREFUL! This is a fun alternative to other boiling point experiments, but because of heat hazards, this activity should never be performed without adult supervision. This activity uses very hot surfaces and will produce hot vapor, which can cause burns. Follow the procedure carefully, only use small amounts of solution at a time to avoid producing large amounts of steam, and be careful not to touch hot surfaces without proper protection. Work in a well-ventilated area. See Science Friday's projects policy here. Put on safety goggles and a lab apron. Fill a dropper with the first liquid that you would like to test, and practice using it to drop single drops into the cup one at a time (this might seem easy, but every dropper is different, so it is good to practice). Gently sprinkle talc baby powder over the surface of the pan, so that it completely covers the surface. Using your spatula, make four “wells” or craters in the talc baby powder about one or two inches apart. These will help keep your droplets of liquid separate from one another on the pan. Download and print out your observation sheet, and find a safe place to record your observations away from your heat source. 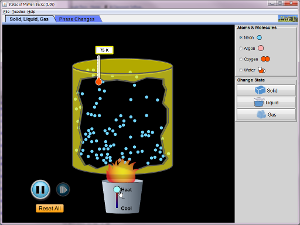 You are going to observe how droplets of each of your experimental solutions behave as the skillet heats up. Take a moment to make a prediction: Which solution do you think will exhibit the Leidenfrost effect at the coolest surface temperature? Which will show the effect only when the skillet is really hot? Starting on low heat, carefully squeeze a single droplet of each solution into its own well in the talc baby powder. Record your observations. Repeat this drop-observe procedure as you very slowly turn up the temperature to Medium, and then Medium-High heat, adding droplets and recording observations every 3-5 minutes as the surface heats up. Pay close attention to differences in evaporation time, simmering, boiling, splattering, or droplet formation for each solution. When a solution produces quiet droplets that do not sizzle or evaporate, but instead float on steam, you’re seeing the Leidenfrost effect in action. You can turn off the heat to the pan once you have observed the Leidenfrost effect in each of the four solutions. When you are finished, let the pan cool. Do not use cold water to cool the pan, as it may bend the pan or cause dangerous amounts of steam to be produced. As the pan cools, review the observations you recorded and identify the solution that showed the Leidenfrost effect first and the one that showed the Leidenfrost effect last. Also pay attention to your cooling pan—some of the Leidenfrost droplets will revert to boiling and sputtering as they lose heat. Does the boiling point of a solution appear to be related to the surface temperature needed to achieve the Leidenfrost effect? What other differences did you observe between the solutions as the surface heated up? After you observed the Leidenfrost effect, did you notice any of the Leidenfrost droplets shrinking or drying out? Which ones? How might boiling point be related to these phenomena? Using an IR thermometer and a stopwatch, you can experimentally determine the Leidenfrost points of the solutions you used in the earlier experiment. Repeat steps #1-9 using a single solution in a single well while recording the temperature between droplets. At what temperature do droplets suddenly persist without evaporating? This is the Leidenfrost point for the solution!